The offseason has been kicked off. Been easing into the offseason since Nationals and have worked my way up from 150 g carbohydrates to 300-350 g the last 2 weeks. I like to work with ranges in the offseason, more freedom. Meal 1: 100g Oats, 150g Yogurt, 1 scoop WPC, 1 scoop WPI, 250 ml Almond Milk, 30g natural peanut butter. Additional fats: 8 fish oils, 10 ml flaxseed oil. Current weight is 88 kg goal weight is 100 kg by June. Training has become a four day split to allow enough rest and to try avoid injuries I keep getting. Weight is currently 90kg unsure of bodyfat still reasonably lean. Wrists are still injured so still training four days a week focusing on pulling movements as they don't seems to hurt my wrists. Strength is increasing especially in the dead lifts doing a 4x4 routine on compound movements such as squat and dead lift and 5x10 routine on stiff leg dead lifts, incline bench and military press. Trying adding in biceps but curling hurts wrists too much as its to hard to do thumbless grip (thumb tendons in both wrist are strained). Looking at making some good progress in the compounds this offseason and possibly compete in some powerlifting meets for variation. Ran out of time to do Biceps and didn't want to inflame wrists more. Curling seems to set them off. Hitting Shoulders on Thursday and hoping to get some PB's on the over head press! Currently eating 3200 calories a day plus the occasional glass of milk. Currently gaining about 0.5 kg a week so if I continue at this rate will hit my target weight in 20 weeks, I would imagine the rate of gain to decrease significantly over the next 2 months or so. Christmas time soon though which means big family feasts! Killed chest yesterday and did incline dumbbell press rather than barbell. Chest is incredibly sore today, and the stimulation from the dumbbells was unmatched by the barbell felt amazing! Really focusing on squeeze and contraction, not really lifting heavy at the moment giving the wrists a little more time to recover they have definitely come along way. Really wanting to improve chest this offseason so going to start incorporating 2 chest routines a week. One chest & Tri's the other chest only. Main focus will be on incline. Weighed in at 93kg this morning, a bit of a gain more than I would want might have been the salty food I ate the previous night though. Monitoring progress both on the scales and in the mirror aiming at a 0.5-1kg gain a fortnight. This guy is a true inspiration for me, reminds me bodybuilding is a sport that takes decades to develop a phenomenal physique. Trained shoulders, Traps and abdonimals today. Then static hold and squeeze with 12kg dumbbells. Feel reasonably good, and had plenty on energy and focus for a 5am workout! Still feeling the burn 3 days after the workout! I noticed my foot position in the squat is not symmetrical and when I position them in the same spot feels awkward. Looking forward to killing back tomorrow especially since I have some more Rammstein tracks to blast in my ears ! I think my deadlift form was really sloppy due to tight hamstrings got that O not so good feeling in the lower back! Didn't really get the pump I usually get from a back workout, and wasn't to happy with my form should have listened to my body and dulled it down. Feeling pretty unmotivated at the moment and think my progress is going backwards both in terms of strength, weight and size. Got sure what the exact cause of this is I'm sleeping well (7-8 hours), have plenty of energy, eating well (calorie surplus), not stressed and yet I feel I'm not making progress. Current program is 5 days a week the extra session being a quick 20-30min chest workout. Added the extra chest workout as it is an area I feel I need to improve. Other areas I want to focus on are back thickness and broadness in the shoulders. They are well rounded but really want to work on the broadness this offseason so can get a better V taper for the 2014 competitive year. Not expecting to see dramatic gains, but it feels like I'm heading backwards judging on weight,strength and appearance. Okay... second chest session of the week tonight hoping to hit some PR's for some extra motivation! I have upped my fats (add 30g natural peanut butter as a bedtime snack) and carbohydrates (50g). Feeling a lot better but oddly still feel hungry all the time despite eating 3,600 calories a day! Haven't weighed myself for a while now and will do tonight to track progress, woke up this morning and wrists felt extremely stiff hopefully this is a step back from my recover seems to come right throughout the day with massage and light stretching. Absolutely murdered legs on Saturday! - Back Squats 140kgx12x3 fourth set went to failure got 14 reps time to up the weight! Legs are still extremely sore/tight spent a few minutes yesterday trying to foam roll it out, was incredibly painful! Routine was rather average no real impressive lifts, moved houses Sunday night and had an average sleep. Hit back and biceps this morning ran out of time to train biceps properly but will make up for it later in the week. I did rack pulls instead of deadlifts due to hamstrings still being sore/tight from the leg workout on Saturday. First time doing rack pulls and I think I'm going to stick with them, great pump in the lower back and harder to break form. My De Quervain's Tendinitis is back!!! Fark!!!! Only in the one of my wrists this time though, an awkward hand placement when getting out of bed this morning set me back 10 weeks of recovery! Hoping to train chest tomorrow the wrist wraps I have seem to help alot as they are good at taking the movement out of my wrist so thumb doesn't have to bear much/any load. Tried doing shrugs with and without straps. Both hurt my wrists so oped for some light upright rows. 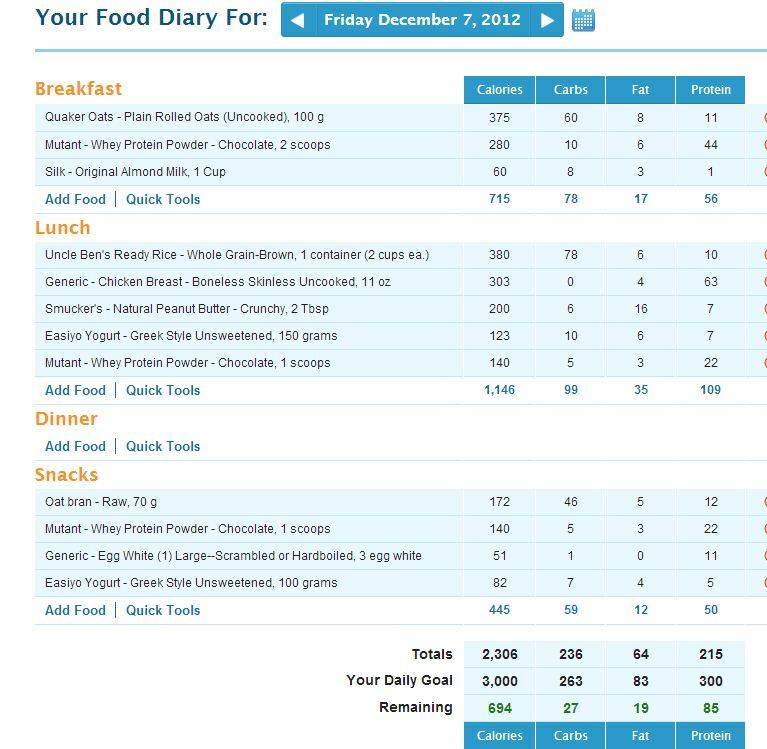 My macros for the day so far. Started using MyFitnessPal today its a great app if you have access to the internet throughout the day. Where will I get bulk chicken breast in Wellington?